Most Sundays I wake up and want to do nothing. Laze around. Pick through the NY Times. Play endless games of Letter Linker. This Sunday I woke up restless. I wanted to pop up and go somewhere. I bugged my husband into coming along. 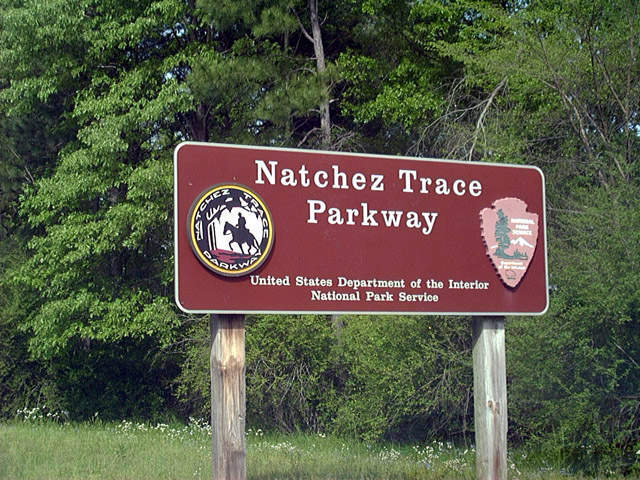 So we drove through Warner Park, out Highway 100, and hit the Natchez Trace . Man that place is beautiful. A winding tree-lined road that looks as if the world never touches it. The trees were barely into fall colors, with only hints of yellow and red here and there, but the light was different. Not that harsh summer light that hurts your eyes, but crystal sharp and clear yet soft. Even though the landscape was mostly green it looked like fall. Later a flock of huge, black vultures flapped into the air as we drove by. And as we were about to turn off the Trace we saw a hawk gliding in the sky above us. Not what I see everyday. Sheesh, I sound like Outdoor Girl, or a shill for the Department of Tourism. So, okay, I was impressed. Wasn’t hard to be. I imagine those of you who live in the country or on farms are a lot closer to the natural world than I am. I wonder if you get inured to it. Does it still seem magical if you see it every day? I guess it’s hard for all of us to slow down and se e what’s around us. I recommend a Sunday Drive. You never know what might be around the next curve. Annie, I love, Love, LOVE the Natchez Trace Parkway. I traveled up the entire parkway last spring (all 444 miles). I want to write a kids' book about a Trace journey so it was a research trip. There are some amazing sights along the way. I'm afraid to ask but what's letter linker? BTW, I grew up in an undeveloped area, and no, it doesn't get old. Rae Ann, I'm envious of your trip. Sounds like your kids book would be terrific. I'm hoping to get another trip out of my husband. Maybe to Tupelo. How long did it take you to do the whole 444 miles? Letter Linker, W&C? It's kind of like Boggle solitaire. It's one of the games on the att.net home page. Annie, we started in Natchez and traveled for 2 days, then left the Trace and spent the night at home, then re-entered and finished the trip. We stopped at a lot of the sites so I wanted to take our time. The Tupelo visitors center is extremely interesting and the park rangers have lots of good info. If you get the chance, go to Jackson Falls, just 40 mile from the end of the parkway in Nashville. It's a nice day trip.